3C58 is the remnant of a supernova observed in the year 1181 by Chinese and Japanese astronomers. A long look by Chandra shows that the central pulsar - a rapidly rotating neutron star formed in the supernova event - is surrounded by a bright torus of X-ray emission. 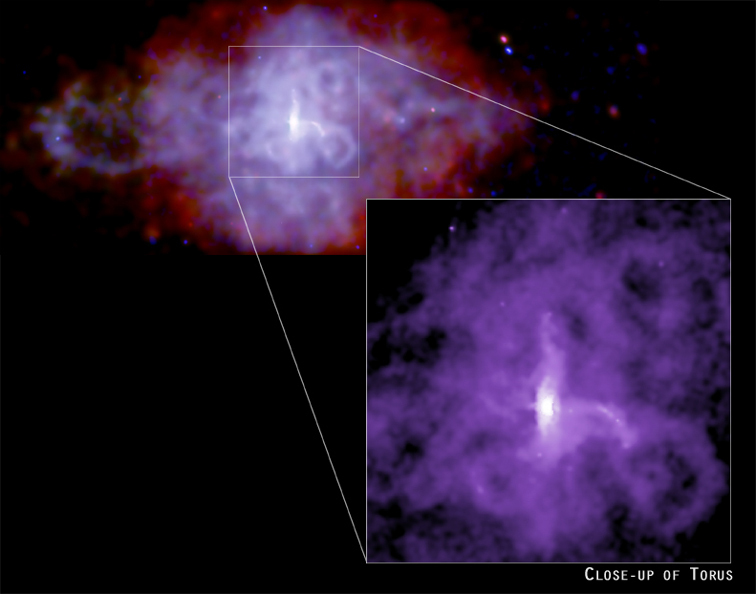 An X-ray jet erupts in both directions from the center of the torus, and extends over a distance of a few light years. Further out, an intricate web of X-ray loops can be seen. These features are due to radiation from extremely high-energy particles moving in a magnetic field, and show a strong resemblance to the rings, jets and loops around the Crab pulsar. 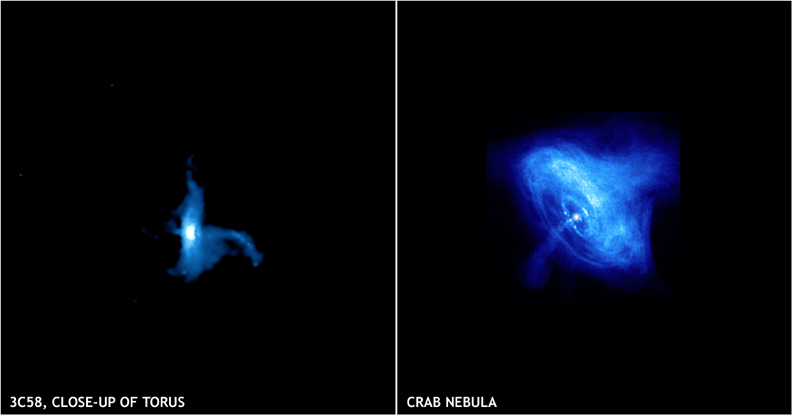 The 3C58 pulsar, the Crab pulsar, and a growing list of other pulsars provide dramatic proof that strong electromagnetic fields around rapidly rotating neutron stars are powerful generators of both high-energy particles and magnetic fields. The pulsar in 3C58 can't be seen directly in this image, but its presence has been deduced from an earlier Chandra discovery, and confirmation at radio wavelengths, of rapid (66 millisecond) pulsations. The present observations provide strong evidence that the surface of the 3C58 pulsar has cooled to a temperature of slightly less than a million degrees Celsius. The relatively "cool" surface temperature was a surprise to astrophysicists, since the standard theory for pulsar cooling predicts a much warmer surface at an age of only 830 years. The cooling of a pulsar is due to collisions between neutrons and other subatomic particles in its ultra dense interior where one teaspoonful of matter can weigh more than a billion tons. These collisions produce neutrinos that carry away energy as they escape from the star. The speed of the cooling in 3C58 indicates that the interaction between neutrons and protons are not well understood at the extreme conditions in pulsars, or that an exotic form of subatomic matter is present. Scale Image is 12.1 x 4.2 arcmin across.